The Mayo Clinic Video Production Unit supports a wide range of video requests from all Mayo Staff ranging from Patient and Staff Education, entertainment, media interviews, news conferences and live surgical broadcasts. The TV studio, combined with our video editing and Master Control, is able to create and distribute live and recorded video programming throughout Mayo Clinic and anywhere in the world via web or satellite uplink. On Monday, July 20 we provided interactive behind-the-scenes guided video tours of these facilities via Periscope. Because 'scopes are only available for 24 hours, we've edited the video and uploaded our YouTube channel for those who missed the live broadcast. 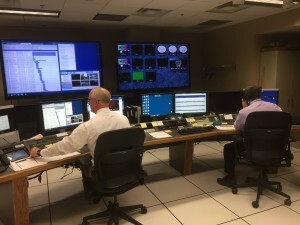 See how this hub on our Rochester, Minn. campus supports videoconferencing connections across Mayo Clinic, within and among campuses from Florida to Arizona, as well as national and international news media interviews with Mayo Clinic physicians and scientists.